In the Capricorn Research household, Eddie Izzard is the funniest man alive. His mythological humour might not be to everyone’s taste, but as a transvestite, marathon running comedian he has to be out there on his own. Capricorn research has a collection of 328 charts of comedians and Aquarius is by some distance the most common Sun sign with a score of 41, 50% above the expected 27. Capricorn and Pisces also score highly. Aquarians typically have clear and alert thinking processes but also have the capacity to think beyond the narrow conventional thought patterns that consume most of us. They are frequently quite original and certainly have the capacity to think and act laterally. Perhaps this is an important skill for a comic particularly one engaged in stand up as there is a need to react quickly to situations on stage and an ability to see the funny side of otherwise normal situations. Eddie Izzard has a stellium of 6 planets in Aquarius. Its exceptionally unusual to have so many planets in such a small part of the Zodiac. A stellium will generally show a person who expresses a tremendous amount of energy in their chosen field. Anyone who has watched him perform in front of thousands on his own for 2 hours at a time would testify to having seen a continuing stream of consciousness that gives the impression he is making it up as he goes along. His act is littered with mime and the impression given is that the stage is populated by all kinds of bizarre mythological and historical characters. It is as if all those 6 Aquarian planets are on stage performing together. Izzard also has the Moon in Pisces , the most sensitive of all astrological placings and his capacity to derive many impressions from any given situation is extraordinary. The Moon in Pisces is in the 7th house which rules relationships but also has something to say about gender roles in general. Pisces as a sign seldom conforms to what is normally expected and feels that the boundaries that others feel so acutely are very malleable and in some cases don’t even exist. It’s probably this placing that has pushed him to explore his transvestism. The Aquarian stellium particularly with the Sun / Venus / Jupiter conjunction gives him the confidence to express this part of his nature comfortably on stage. Eddie Izzard is exceptionally hard working as is usually the case with Virgo rising. He also has Pluto closely conjunct the Ascendant which adds great power to his personality but also gives him a strong capacity for reinvention. Not content to stay within the narrow confines of comedy he has taken on many acting roles. But the one thing that few would have expected was the marathon running. Like everything Izzard does, it was done to excess the way that only someone with a close Sun/ Jupiter conjunction can. Despite having had no previous experience of long distance running he completed 43 marathons in 51 days for Sports Relief, a testimony not only to the physical endurance but also sheer stubbornness of 6 planets in the Fixed sign of Aquarius together with Pluto rising. The fact that most of the stellium is in the 6th house of health and fitness shows Izzard’s obsession in these areas. One other factor of Pluto rising would be that he would be very responsive to and affected by the planet’s transits. The first one was a watershed for him at the early age of 5. 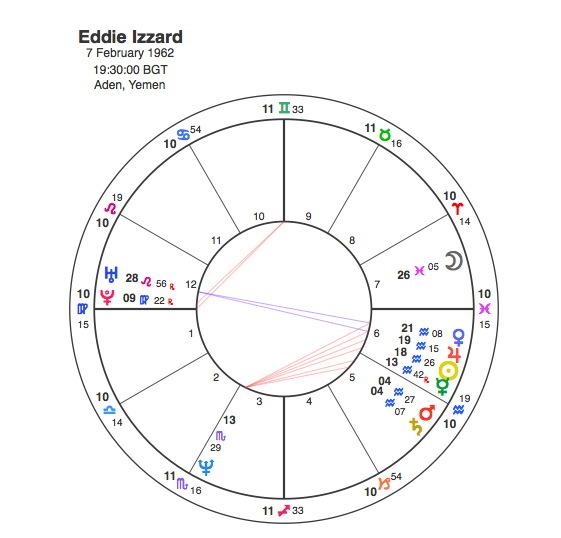 The Moon in a child’s chart rules the mother and Eddie Izzard’s mother died in 1968 with Pluto opposite his Moon. This traumatic event has been a major influence throughout his life. Izzards’s big breakthrough into comedy mainstream came in 1991, when he got a spot on the Fry and Laurie-produced AIDS benefit Hysteria 3, where he did his “Wolves” sketch. Pluto was in square to Izzard’s Sun in 1990 – 91 indicating a turning point for his career. In 2006, Izzard played the part of Wayne Molloy in a US television series called The Riches. This was a significant move towards a career in acting. In March 2007, he was listed as number 3 of the 100 Greatest British National Comedians. Pluto was square to his Moon in 2006-7. Eddie Izzard has indicated a future plan to stand as Mayor of London. As would anyone with 6 planets in Aquarius he has strong political views of a liberal nature. There are no major transits in the near future that might suggest such a development but his determination is such that noone could rule it out. Much of Izzard’s comedy is based on mythological history but his take on it is decidedly of the Aquarian age. Enjoyed this. I am five days or so younger than Eddie, so i have the same stellium components, but all in the 12th. I’m also a performer. I love what Eddie does. Someone predicted the anti-christ would be born during the 1962 Jan/Feb Aquarian stellium. It’s almost certainly Eddie. Thanks Harry. Who knows it could be you. I’d love to find out who made that prediction. Interesting that on that day, Ringo Starr played his first gig in the Beatles – so you could make a case for them being born on that day too. Awesome. These apparently unconnected things are always meant to happen for a reason. Now you have to include that antichrist thing. During a solar eclipse, an extremely rare grand conjunction of the classical planets occurred, for the first time since 1821. It included all 5 of the naked-eye planets plus the Sun and Moon), all of them within 16° of one another on the ecliptic. Saturn, Jupiter, Mars and Venus were on one side of the Sun, while Mercury and Earth were on the opposite side. When the Moon crossed between the Earth and the Sun, the eclipse was visible over India, where predictions of the world’s end had been made. According to famous psychic Jeane Dixon, a child was born “somewhere in the Middle East”, who would “revolutionize the world and eventually unite all warring creeds and sects into one all-embracing faiths”, and who would bring peace on Earth by 1999. The prediction, which did not come true as scheduled, was published in A Gift of Prophecy, the 1965 biography of Dixon by Ruth Montgomery. French President Charles de Gaulle informed the nation that he was negotiating with the FLN for the independence of Algeria, conditional on a guarantee of the rights of “the minority of European origin in Algerian activities”, and “an effective association” between Algeria and France. Hours before the Beatles were scheduled to play at the Cavern Club, drummer Pete Best told his fellow musicians that he was ill and wouldn’t be able to appear. Determined not to cancel the show, the group called around for a replacement and Ringo Starr, whose group had the day off, appeared in Best’s place. Thats astrology for you. I get jiggered 3 or 4 times an hour. Have you looked into Human Design?